When it comes to landing pike, a large, knotless landing net with arms of at least 36 inches, or a round frame of at least 30 inches, should be used. Ensure that the mesh of the net is well sunk before drawing the pike over it and lifting the net sufficiently to retain the pike. Holding the net by its frame will take the strain from the spreader block, and allow you to carry net, rod and fish safely together to the prearranged unhooking area. If necessary, gather up the mesh to raise the pike further from the ground. If fishing with a friend you can keep the pike in the water in the landing net while they ready the unhooking equipment. Never lay pike down on hard or rough surfaces, always use an area of soft grass or better still a well padded unhooking mat. 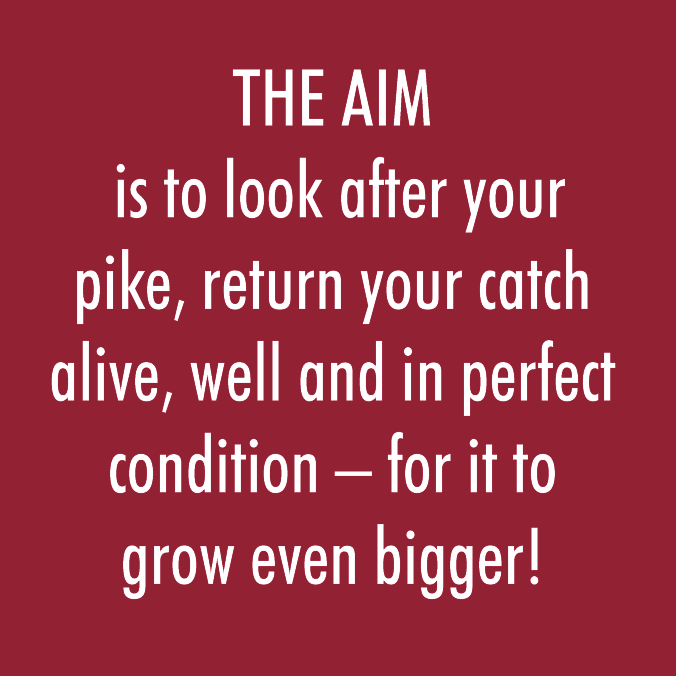 With your pike safely in the net and carried ashore, place it on a large, padded unhooking mat. Look to see where your hooks are before proceeding to handle the fish. Turn the pike on its back and insert one or two fingers under a gill plate, keeping them well away from any hooks. You might like to wear a gardening glove on the hand you do this with, although some sensitivity is lost doing this and if possible get used to not using a glove. Lift the pike’s head carefully and its mouth will usually open. Maintain this hold while you use a pair of 10-12 inch artery forceps to grip and remove the hooks – top hook first, then the lower. It is now that you will appreciate the use of semi-barbed hooks. If the hooks are in deeper near the throat, insert the forceps through the gaps in the gills below your ‘holding-hand’. Please do this with great care and preferably under instruction if for the first time. With lively fish it is often easier to unhook the fish by kneeling astride it. When fishing with lures, which tend to have bigger and thicker-wired hooks fitted, you will benefit from the use of pliers as opposed to forceps. Always carry a strong pair of side-cutters in case you need to cut through the hooks to aid unhooking. When you are a lot more experienced you may want to unhook pike in the water, thus minimising contact. Despite the awesome look of all those sharp teeth, the pike will not purposely bite you. Don’t be frightened; treat the pike with respect and confidence. If the hooks are difficult to get out, do not cut the trace, unclip it. Put the pike in the landing net and into the water. 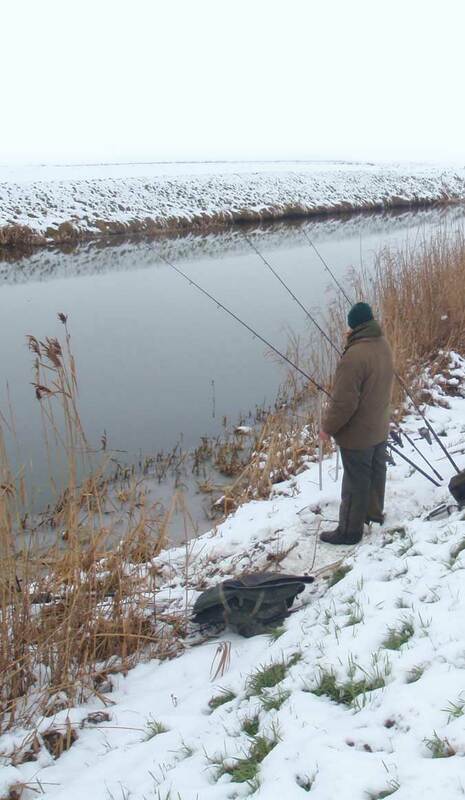 Then seek help from another pike angler, do not feel embarrassed, we have all been there. Once you have safely landed and unhooked your pike you might want to weigh it. There are many well designed weigh slings on the market today and one of these should always be used. Make sure that the sling is wetted on the inside before carefully placing the pike in it. To get an accurate weight for your pike, the scales should be zeroed with the empty, but damp, sling in place. Then when the fish is weighed in the sling the weight you read off the scales will be the weight of the fish – no need for difficult maths deducting the weight of the sling! If you are fishing with a companion this is not a problem as they can take the photographs for you. However, if you are fishing alone you might need a few minutes to set up your camera and the pike should not be kept out of the water while you do so. 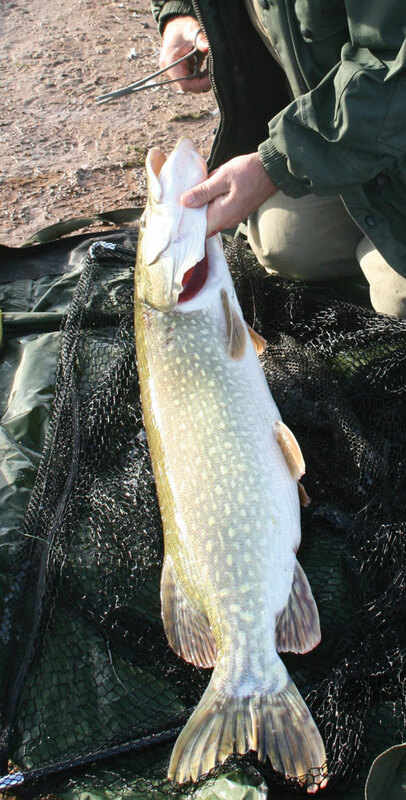 Obviously the pike will need to be retained in the water, never use keepnets; they are not suitable for retaining pike. The use of a ‘pike tube’ is recommended in preference to ‘carp sacks’. Sacks can cling to the gills of a pike, and get entangled in their teeth which will affect the fish’s breathing. Pike tubes keep the soft material away from the pike and the fish seem much happier in them than they do in sacks. Wet the tube before sliding the pike into it, stake the tube out horizontally in as deep water as you can. Make sure that the head of the pike faces into any flow or wave action as this will improve the flow of oxygen through the fish’s gills and speed its recovery. Once a pike rolls on its back and is left unattended it will die, so check that the pike is the right way up at regular intervals if it is kept in the tube for more than just a few minutes. Never retain pike for prolonged periods, and overnight retention is strongly discouraged. If boat fishing the tube can be secured to the gunwales, but if you have to move the boat with the tube over the side, you should do this as slowly as possible, and certainly not under motor power. Don’t move a pike any distance out of the water, either when boat or bank fishing. When removing a pike from a tube always hold both ends of the tube while you allow the water to drain away, lay it on a soft surface and slide the pike out head first. A pike that has recovered its strength while in a tube will be livelier than when you first landed it! Take care not to lose control of it at this stage. Be firm with it until it quietens down sufficiently to be handled easily. Once a pike has been weighed it can be safely carried back to the water in the sling for a careful release. Slip both sling and fish into the water and ease the pike out into its natural element. Always ensure that the pike can support itself before releasing your grip on it. If it has difficulty staying upright it will need careful nursing to recover. Stay with the fish for as long as it takes for it to maintain its balance unaided. A fully recovered pike will swim steadily away.